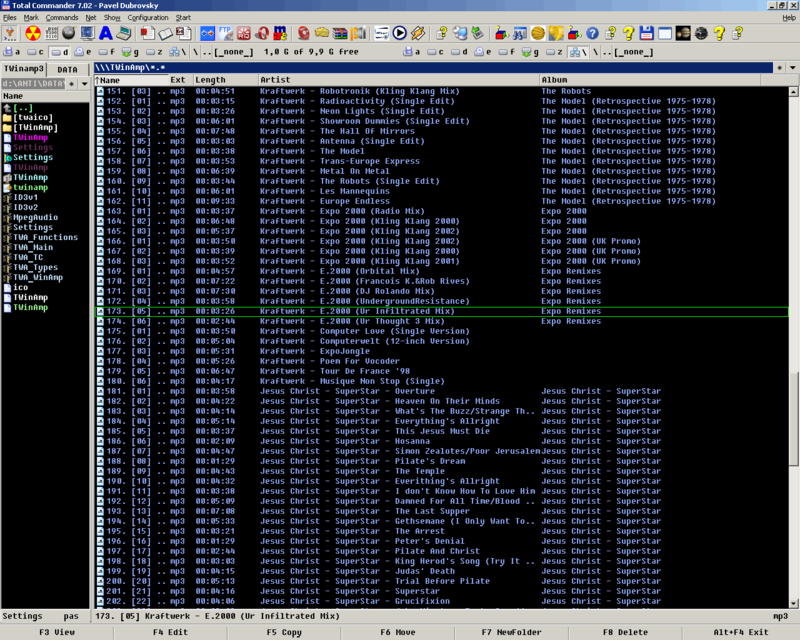 + Work with winamp playlist like with filesystem. Just copy whatever to plugin filesystem. All supported files can be added to Winamp playlist. Also you can copy files from playlist and delete it as usual! + MP3 ID3 tags editor. Just press Alt+Enter on mp3 file to call editor. + Saving playlist. Type "save" in commandline, and playlist will be saved in specified directory. + User columns support (NEW!). Now plugin support custom columns with mp3 ID3 tags. You can configure it in Custom columns section of TC Options. + Thumbnails support (NEW!). Press Ctrl+Shift+F1 in plugin filesystem, and plugin will search for tracks associated thumbnails. This is new version of TWinAmp plugin, based on my own TWinAmp2 plugin. Original sources has fully refactored, almost all reported bugs fixed. Also almost all new features of Total Commander 7.0 supported now: user custom columns in filesystem plugins, thumbnails, etc. I plan fix all unfixed bugs, and leave this plugin forever. Source code of plugin also will be available from this moment.